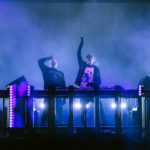 Future bass outfit, Illenium, is a blossoming talent who time and time again proves his forward-thinking approach to melodic bass with every track he touches. From beautifully reimagining tracks from Kaskade and Galantis to continuing his artistic self-discovery in original productions with “Only One,” the Denver-based producer recently took the lovely singer/songwriter Niykee Heaton’s “Infinity” for a melodic whirl. Illenium pillows Niykee’s voice with vaporous snares and a slick guitar line to deepen the track’s sing-a-long nature before he drives listeners straight into a spine-tingling future bass blast that takes the overall emotion to new heights.